Matrix Code Emulator Screensaver emulates the green code you see on dozer's screen in the movie The Matrix. Watch the green glyphs fall down your screen in a randomized pattern, creating your very own Matrix. The program now features optional quotes from the movie, as well as options for resolutions, and scrolling speed. 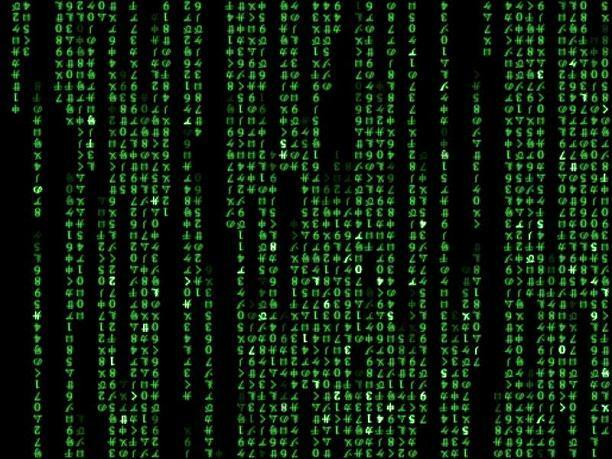 Matrix Code Emulator Screensaver brings the movie's famous, rapidly moving green computer code to your desktop. ...... desktop. In addition, Matrix Code Emulator Screensaver displays well-known quotes from the film, although you can disable this option if you like. You also can customize several aspects of the code's appearance, such as movement speed, density, and highlight percentage. A free screensaver showing the beautiful code from the matrix. Matrix Code Screensaver has fully animated neo, morpheous and trinity, for free! Amimated 3D Screensaver inspired by The Matrix movie. Get an inside look at the way the Matrix works. The classic matrix screen, but with falling Guitars. Qweas is providing links to Matrix Code Emulator Screensaver 1.5 as a courtesy, and makes no representations regarding Matrix Code Emulator Screensaver or any other applications or any information related thereto. Any questions, complaints or claims regarding this application Matrix Code Emulator Screensaver 1.5 must be directed to the appropriate software vendor. You may click the publisher link of Matrix Code Emulator Screensaver on the top of this page to get more details about the vendor.